The 9 Facts about Scuba Diving you need to know! As of yesterday I am officially certified to scuba dive in open waters! It took me a bit longer than planned, but hey, that's just my speed I guess. Before starting my Scuba Dive course I had no previous experience or knowledge about it! These are 9 facts I learned about Scuba Diving. SCUBA is actually a abbreviation for Self Contained Underwater Breathing Apparatus. This term was originally used to describe rebreathers used by U.S. combat frogmen. They were used in World War 2 for underwater warfare. Before diving you should spit, yeah spit, into your dive mask. This will prevent the mask from fogging. One of the safety risks during scuba diving is decompression sickness. Decompression sickness occurs, as a result of build-up of gases in the bloodstream and the pressure is reduced too quickly. You need to avoid this by ascending slowly. If decompression sickness occurs and first aid is not successful, there is a serious risk of death or permanent disability. Yikes! The main rules for scuba diving include getting sufficient training, never diving solo, being in good shape, ascending slowly and with control, not holding your breath, checking equipment before and during your dive, planning your dive and diving your plan! Sharks are actually known to be safer than coconuts. 150 people are killed yearly from falling coconuts, whereas only 10 people a year are killed from sharks. There are over one million people obtaining their scuba diving certifications every year. Only 10 precent of the sea has ever been explored.Whoa! So much exploring to do! Under water sound travels much faster than on land, making it difficult for divers to determine where sound is coming from. Underwater object will appear to be 33% bigger and 25 % closer than they actually are. Of course there is much more when it comes to Scuba Diving but this is a brief summery of some of the stuff I learned. I can't wait to go diving in Hawaii in 10 weeks! 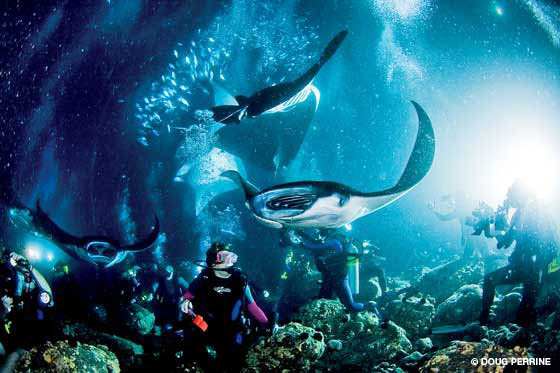 We are planning to do the night scuba dive with Manta Rays. Have you ever been to Hawaii, or do you have any tips for great diving spots ?